Enjoying the Adrenaline Activities using Motor Trail as a Way to Explore Bromo. Plan to rent motor trail in Bromo and enjoy the great adventure there will be a good idea for you who love the challenge. Visiting Bromo east Java, Indonesia, will be such a great chance for any of you who love nature and even challenges. There will be a lot of fun activities which are ready to be enjoyed. Of course, it depends on the interest and also your hobby on dealing with the activities which you choose to be enjoyed there. If you really in love enjoying the challenge in Bromo, of course you can choose to enjoy the extreme sport which will also be adrenaline pumped. You can explore Bromo with a bunch of challenges to be enjoyed there. It is a good thing to be done by any of you who are planning to enjoy Bromo with the high challenge. For the extreme sport lovers especially the motor trail lovers, exploring Bromo using the motor train is such a good idea which needs to be listed on your vacation plan to Bromo to do list. If you have decided to enjoy Bromo using motor trail, it is such a good idea for you to start hunting the place which rents the motor trail there. 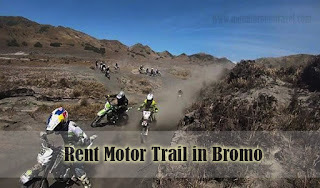 Searching online is a good idea to find some references to rent motor trail in Bromo. You also can ask friends who have already been there enjoying this activity. Still, it is a good thing for you to be really careful on choosing the service provider which rents their motor trail. You can choose one which offers the good service, for example which is ready to pick you up from your place, for example if you want to motor trailing at Bromo from Malang, and you need to find the provider which is ready to pick you up or bring the motor to you. Never forget to notice the stamina or condition of the motor trail. Noticing the cost of renting the motor trail is also really essential for helping to not to be over the budget. There are some tips if you are ready for the adventure at Bromo using the Motor Trail. As we have mentioned before, do not forget to make sure that the motorcycle is in a good condition and has a good stamina as well. You can check it first. Then, never forget to prepare your body fitness and stamina as well since it will require you to use your stamina. Then, safety still on the first list and you need to wear the proper safety stuff, as like proper jacket, helmet, and other safety stuff. That will be a bunch of fun for you to rent motor trail in Bromo and explore Bromo in different challenge.